Nearly 400 school leaders, teachers and staff from Washington state to Connecticut converged here this week to learn how this school district has used technology to improve its academic performance. The Mooresville school district ranks second of 115 school systems in North Carolina by a composite measure of academic achievement in the state, although its per-pupil spending puts it 108th. The district’s graduation rate this year reached 93.4 percent, and 95 percent for African-American students, whose graduation rate was just 67 percent six years ago. Mooresville is hosting educators from around the country at the event, called Summer Connection 2013, with the goal of offering lessons on how technology can be used to drive student improvement. School districts as large as Houston to ones smaller than Mooresville’s 5,590-student population have sent representatives to learn at the three-day event. Whenever possible, Edwards credited others for the academic gains, focusing on the students, teachers, principals, and other staff members from Mooresville who helped produce the results that were dissected in various workshops at Summer Connection 2013. “Learning [happens] best in a shared environment,” said Edwards, who took over the leadership role of the district in 2007. Connectivity, it seems, is about more than just technology. Edwards cautioned that, “the idea that you can just pass out laptops,” and bring about systemic change is a misguided one. It takes vision and alignment of goals, and an “all in” approach, he said. It also takes the support and cooperation of teachers, parents, the community, and businesses, along with engaged students, to make a digital conversion of a district successful. Edwards also explained what it did not take—more employees. 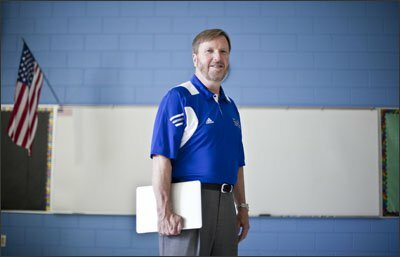 “We added one tech staff person in five years,” he said, adding that some jobs were effectively “repurposed,” by taking computer lab teachers and making them “tech facilitators,” for instance. Mooresville launched its conversion during economically challenging times. In its first year of deployment, the state announced a deep funding cut, and the district laid off 10 percent of its staff, including teachers, principals, and drivers. That philosophy is one he wanted to promote among the sold-out audience of educators. “We have to have the emotional courage at a time when we have less funding, and more challenges than ever,” he said. In June, President Obama and Education Secretary Arne Duncan visited Mooresville in conjunction with the president’s announcement of ConnectEd, a plan to overhaul the federal E-rate program and allocate more federal funding to boost teachers’ skills in using classroom technology. Summer Connection 2013 continues through Thursday. What’s the number missing below? "The Mooresville school district ranks second of 115 school systems in North Carolina by a composite measure of academic achievement in the state, although its per-pupil spending puts it 108th. The district’s graduation rate this year reached 93.4 percent, and 95 percent for African-American students, whose graduation rate was just (…….) percent six years ago." Mooresville’s tremendous focus on one data point — the percentage of students passing proficiency exams — has its pitfalls as well. At November’s quarterly data meeting, there were kudos for several numbers whose rise or dip was not statistically significant, and no recognition that the students who passed by one or two questions could very well fail by one or two the next time around. Several colorful pie charts used metrics that were meaningless.